than the average club player? and some players can’t even keep a positive score? No, they don’t just calculate variations. Strong players don’t just memorize opening lines. They don’t just look for tactics every move. What set really strong players ahead of the pack is their DEEP and CLEAR UNDERSTANDING of the game. This clear understanding allows them to ‘JUST KNOW’ the right move! With their deep positional and strategic understanding guiding them like a compass, strong chess players can tell the right plan and ideas and KNOW the RIGHT move ALL the time… without breaking a sweat! The PROBLEM With Modern Club Players. Modern club and tournament players do NOT understand chess. They can only envy the positional and strategic understanding of old-school masters like Capablanca, Steinitz, Nimzowitsch, Rubinstein, and others. 1) Training their tactical skills and combinative eye by solving hundreds or even thousands of tactical exercises. 2) Studying and memorizing sharp opening lines. They even buy monthly chess opening publications to keep them up-to-date with the latest theory. 3) And when it comes to playing, they love positions that allow them to attack. At first sight, it seems there is nothing wrong with it… until the average tournament player encounters someone stronger, someone who UNDERSTANDS chess better and deeper than they do. The time they spent on opening preparation, honing tactical skills, and attacking technique ALL go out of the window when they encounter a position that requires clear positional and strategic UNDERSTANDING. The stronger player SLOWLY but SURELY outplays them, snuff out their counter chances, and ultimately, bring the point home. I’m not saying that training your tactical skills, attacking technique, preparing for openings, etc. won’t bring you anything. Yes, they will improve your game. You may win a game or two in fine style. HOWEVER, to break through the small league… the elite circle of REALLY strong players, you need to take your UNDERSTANDING of chess to a DEEP and CRYSTAL CLEAR level. To get that QUALITATIVE LEAP in your chess development, you need to go beyond studying tactics, opening lines, etc. You need to have a clear and deep UNDERSTANDING of chess. Want to make GREAT progress in chess but don’t have 8 hours a day to spend on training. Want to clear up ALL of your QUESTIONS in chess. Want to WIN MORE games and tournaments. Want to get that MASSIVE increase in rating points. Want to keep your level of play in GREAT shape ALL THE TIME. Then you will SURELY LOVE this course! Reveal the SECRET of REALLY strong players: the MOST important strategic and positional rules that enable them to demolish the opposition. Show you how strong players of the past and present use these important strategic rules in their games and win even against the strongest opponents. Hand-hold you and train you so that you will UNDERSTAND chess at a very deep level and make sure you are able to apply this understanding in your games… ALL THE TIME! After careful study of The Grandmaster’s Positional Understanding, you will FINALLY have what it takes to be one of the VERY few (about 1 to 3 percent) STRONG chess players and play the game at a VERY high level! Right here, I will show you what makes Positional Understanding REALLY important and how Grandmasters, IMs, etc. use it all the time. The MAIN guiding idea of chess that will allow you to separate the good moves from the bad ones. How to win MORE and know LESS. You don’t need reams of theory. You only need to focus on the MOST important things in chess! How computers EXCEL in chess and how you can do the same for your game. How Grandmaster’s think in REAL-time scenarios using only 2 VERY important principles. How to evaluate any position EASILY and ACCURATELY. You don’t need to use 15-step evaluation algorithms to precisely know who has the advantage, by how much, etc. Lesson 2: “A Look At The Positional Principles”. This lesson is a continuation of the first one, where we will delve deeper into the MAIN guiding idea of chess and how IMPORTANT it is to keep in mind all the time to find the RIGHT moves in any position. This is where I will spill the beans! I will show you ALL of the IMPORTANT strategic and positional rules. And I won’t just tell you the ‘WHAT’ but HOW they are created as well. This will bring you DEEP chess understanding in a way that’s NATURAL and EASY TO DIGEST. I will show you the 2 VERY important factors based on the MAIN guiding idea of chess. When you keep these factors in mind all the time, you can hardly go wrong! An in-depth discussion of the IMPORTANT strategic and positional principles. These principles, which stem from the main guiding idea of chess, enables STRONG players to ‘JUST KNOW’ the RIGHT move on any position not matter how complicated it is. And with this lesson, you can, too! Lesson 3: “Step-By-Step Guide For Practical Play”. In the third lesson, I will hand-hold you and show you how to use your newly acquired positional and strategic understanding in REAL chess games. I will give you a SIMPLE but EFFECTIVE guide for playing REAL chess! We kick start this lesson with a quick review of the strategic and positional rules discussed on the previous lesson to make sure they STICK and they make a SIGINIFICANT and POSITIVE impact in your game. The REAL role of calculation and tactics. And how this will save you A LOT of time and effort when choosing a move in ACTUAL chess games. Lesson 4: “Strategic Elements – Pawn Structures”. The 2 functions of pawns and how they affect the position. 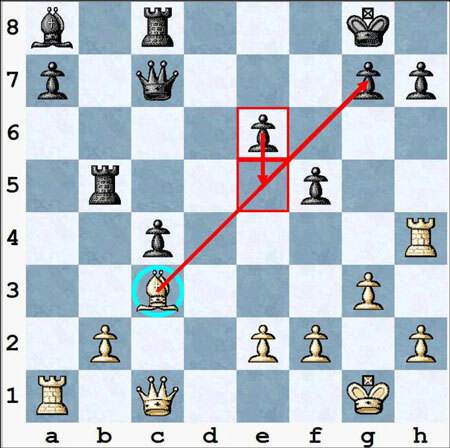 If you know this by heart, you can make all of your chess men: pieces and pawns; work together and bring you closer to victory! How to make your pawns can work in your favor and increase your whole army’s activity while hampering the opponents.With a FULLY active army against a sleeping one, a WIN shouldn’t be too far away from you. What to do with an opponent’s weaknesses so you can bag that point without breaking a sweat. Lesson 5: “How To Take Charge Of Your Future”. This lesson is devoted to the intricacies of the Bishop and the Bishop pair. With this lesson, you will have a deeper understanding of how these clerics work and how to make them an important or even WINNING asset in your games! How to use your Bishops and make sure they have a GREAT impact in the position. 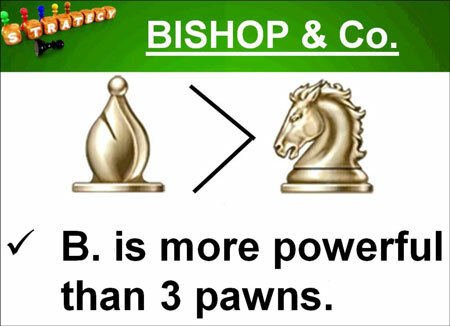 If you don’t know how to bring your Bishops into the game efficiently, you may end up having a ‘tall pawn’… and even lose a game! How Bishops can be very powerful in the endgame. This part of the lesson will help you assess ‘Bishop for Knight’ trades BETTER and how you can have an advantageous or even WINNING endgame! So you are fighting against a Bishop? Don’t worry! I will show you 5 EFFECTIVE weapons that will shut down the opponent’s Bishop. These ideas are even used in many of today’s opening lines! The ONLY disadvantage of a Bishop compared to other pieces, and how you can use this disadvantage so your opponent’s Bishops will be miserable. You will be surprised at how many games are won or lost because of a miserable Bishop! Lesson 6: “Bishop And Company”. In the 6th lesson, we will discuss how Bishops interact with other pieces – Knights, Rooks, Queen, etc. You will heighten your UNDERSTANDING of how Bishops influence the flow of the game and how they work with your pieces, which is ESSENTIAL for taking your game to a WHOLE NEW LEVEL! The TRUTH about Bishops vs. Knight and how knowing this deeply will enable you to get the UPPER HAND in your games. Stuck with a Knight against a Bishop? NO PROBLEM! Later in the lesson, I will show you how you can restrict an opponent’s Bishop and make your Knight stronger than his cleric. Again, knowing these techniques will help you gain an advantage in many of your games. Opposite-colored Bishops have a drawish tendency, BUT there are other unknown rules that you should know about it! These rules can help you turn a seemingly innocent opposite-colored Bishop position into a WINNING one! Why masters and STRONG players almost always play to have the Bishop Pair, and how you can take FULL advantage of the 2 Bishops when you have them in your games! So your opponent’s have the 2 Bishops? Don’t worry! I will show you how to fight back against the pair and make sure you don’t go down easily in flames. Lesson 7: “Other Chess Pieces And Important Rules”. In the final lesson, as the name suggests, we will take a closer look at ALL of the other pieces in Chess – King, Queen, Rook, etc., how they influence a position and how you can take advantage of them according to the positional and strategic rules discussed in the previous lesson. How to use your King effectively and why castling is VERY important. Note: It’s not just about your King’s safety! Know what Rooks NEED to have an impact in the game. With this, you will have BETTER Rook play / techniques and you can avoid the catastrophe experienced by other STRONG players who took this for granted. Haveyou ever wondered why a Knight often appears to be out of game? I will tell you EXACTLY that and how you can turn the situation around… making your steed a force to be reckoned with at the board! YES, The Grandmaster’s Positional Understanding isn’t just informative. It’s NOT just a theoretical discussion of positional play and strategic understanding. This course is ALL about the MOST important strategic and positional rules and, more importantly, it will show you how to apply these in your games! With the heightened UNDERSTANDING of chess, you will make that QUALITATIVE LEAP FORWARD in your chess development. And to make sure the lessons stick, this course comes with a Practical Part. What’s Inside The Practical Part? To take your newly acquired positional and strategic understanding, I have prepared 20 special training tasks that will make those lessons stick. These tasks contain review questions, exercises, annotated games / game fragments, and those are just to name a few. HUNDREDS Commented Games And Puzzles. Within the special training tasks, I will present INSTRUCTIVE positions and game fragments played by the great masters and experts in chess. I won’t stuff you with variations or informatory-type evaluations. Rather, these commented games and puzzles are annotated in a way that makes your new positional and strategic knowledge an INTEGRAL part of your playing strength. Detailed Instructions About What And How You Should Train. The practical part contains enough material to keep you busy and well-trained for MONTHS! To make sure you get the most out of it, I provide detailed instructions on what you should train and more importantly, HOW EXACTLY to do it. Please, be reminded that the course works under WINDOWS platform solely. Aside from the video lesson, you also get the text version of the lessons filled with diagrams for easy reading. This is PERFECT for those who learn more out of reading and want to play through the examples in a REAL board. With a TOTAL file size of 200 MB, you shouldn’t have any problems downloading it… and that means you can get started on your training QUICKLY! Additionally you will get a highly valuable BONUS (you will get it for free, and you’ll find it inside the course’s materials). A deep look at most typical mistakes of chess learners. And more importantly, an in-depth discussion on how to get rid of these game-breaking errors. Clear up all your doubts (questions) about the main course. Help prevent you from making these common mistakes. Get rid of all of the obstacles that keep you from making progress in chess! 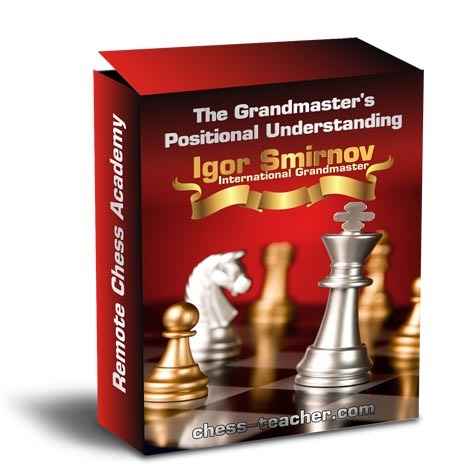 Get the MAXIMUM benefit and the biggest progress out of the main course “The Grandmaster’s Positional Understanding”. What’s Inside The Bonus Pack? 5 extra lessons, including 1 text lesson and 4 video lessons (70 text pages + 85 minutes of video). Text version of the lessons (available for printing) – suitable for learners who get the most out of reading. I’m sure that’s the question you are asking right now. Being a unique… one-of-a-kind course, I could easily put a price tag of hundreds of dollars for “The Grandmaster’s Positional Understanding” and it would still be a BARGAIN! After all, you are going to get the mental tools used by Grandmasters and chess professionals like me. Now, let’s be realistic: $139.00 is a little higher than most chess books, databases, etc. out there today. But did those books and training courses give you the SIGNIFICANT and QUALITATIVE LEAP FORWARD you are looking for? I don’t think so. Or, you can hire a chess instructor online for more or less 3 hours of coaching. BUT would 3 hours be enough to make a HUGE impact in your game? I’m sure you know the answer. So why would you spend your time, effort, and money on things that doesn’t really improve your game? With my course, you will gain that SIGNIFICANT and QUALITATIVE LEAP FORWARD… and I guarantee that! I’m VERY confident that my course – The Grandmaster’s Positional Understanding will bring you that MUCH-needed strategic and positional understanding to turn your game around and help you break through the barrier between average and really STRONG chess players. That said, you can test out my course for 31 Days Risk-Free! YES, you get a 31-day money-back guarantee! Buy the course “The Grandmaster’s Positional Understanding” now and study it seriously. Learn the video lessons and complete all of the practical part tasks (following the corresponding instructions). Then apply these skills in your practical games. Info-packed video lessons oozing with practical advice (200 minutes). 234 special tasks and games for your training to make those lessons stick. The special “Mind Maps” and other KEY materials for printing. Detailed instructions about WHAT and HOW exactly you should train. It’s NOT just theory! It comes with concrete examples, with commentaries, about how exactly you should apply MY recommendations. 5 bonus lessons, including 1 text lesson and 4 video lessons (70 text pages + 85 minutes of video). Text version of the bonus lessons (available for printing) – suitable for learners who get the most out of reading. All answers to your questions. “Are you ready to make a BREAKTHROUGH in your chess development? Do you want to be within the ELITE circle of REALLY strong players who ‘JUST KNOW’ the right moves… the right plans and WIN almost ALL the time? 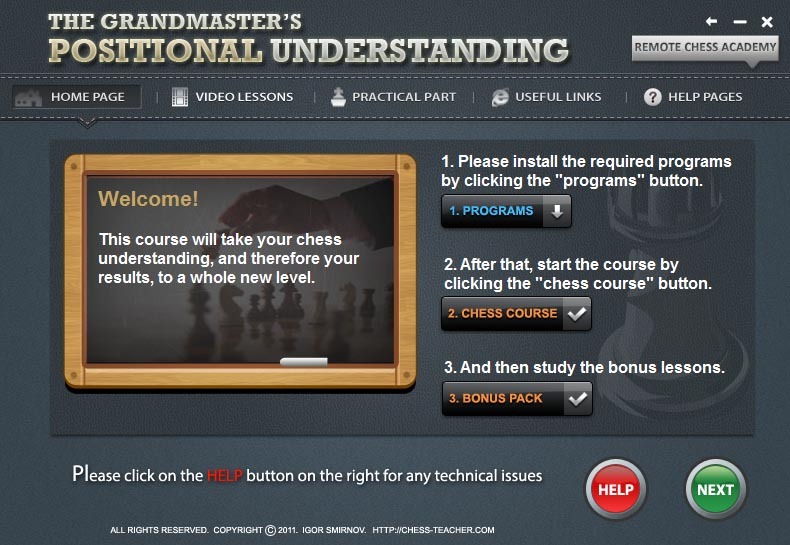 Chess course: “The Grandmaster’s Positional Understanding” + BONUS pack.